Though our academic books cover a range of theological disciplines, our focus is primarily on biblical studies, biblical languages, theology, and ministry/pastoral books. Our goal is to provide worthy textbooks and scholarly monographs. The resources display not only top-quality content, but also a charitable tone, uniqueness, and creativity. That is, they are irenic, avoiding polemical, triumphalistic, or condescending language. Our books interact with the best current literature, seeking to advance the discussion in an engaging, creative, and academically responsible way. We are a theologically conservative evangelical publisher, holding to the essentials of Christian faith. 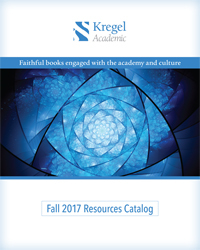 Professors, pastors, and church leaders may purchase single copies of any Kregel Academic or Ministry titles for their personal use for 25% off the retail price. Sales tax (MI residents only) and shipping charges will be added. Contact us to order.